In our first Lupa review back in 2010, we pointed out a dude wearing an Affliction blazer in the restaurant as proof that all Mario Batali establishments have some level of tourist appeal to them. The current-day anecdote would probably be something more along the lines of a group of people wearing the same Crossfit Convention t-shirts, but the analogy remains the same - people who look up to Vin Diesel really seem to love this place. However, in the five years that have passed since that initial Lupa review, we’ve mastered the art of eating here and avoiding the crowds, and it’s really pretty much the way you avoid any bridge and tunnel or tourist situation in New York City - hit it on a Tuesday night. 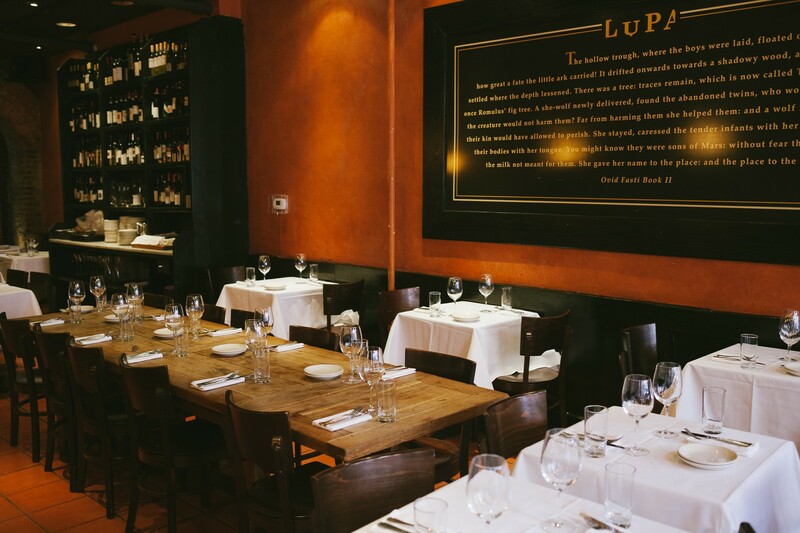 Lupa’s near-Soho location and no-nonsense Roman-Italian menu make it a favorite among the neighborhood for a laid back meal, and we love this restaurant as a destination for that way-too-early-in-the-week dinner that you sort of want to cancel but can’t. Hit it for a bowl of pasta and a glass of wine instead of blowing up your week by accidentally going too hard at Dirty French. The staff is cool, the vibe in the room is excellent albeit a little cramped, and we always find ourselves satisfied with its consistency and efficiency. Play your cards right, and you might even make it home in time to live tweet The Bachelor, or maybe catch The Fast and The Furious: Tokyo Drift on TBS. Whatever you’re into. Make sure to hit the carne section and get a variety of the house-cured meats that Lupa offers. The coppa and the speck are both awesome. This Roman classic is essentially linguine with black pepper and cheese, and it’s a must order. Just know that it’s coming at you absolutely loaded with fresh black pepper, so you better be down for that kind of party. Another classic Lupa pasta, and one of our absolute favorites. The short rib ragu is rich and meaty, and the noodles are fresh and delicious. Do it. Tomato, pork jowl, bucatini... what else do you want from the world? People love this spicy, classic Italian dish, but after a while, all we could taste was burning from the black pepper. We suppose that’s the point, but the chicken doesn’t taste like much after a while. Nor does anything else, really. We like all of the fish options that Lupa has to offer, but have had especially good luck with the Market Fish on any particular visit. It’s guaranteed to be fresh and have some seasonally appropriate things on the plate.